Atlas Converting Equipment Ltd. (Bedford, UK) is pleased to confirm an order for a ‘new generation’ Titan SR9-DS Duplex slitter rewinder from contract converter Applitec S.A., based in Les Echets, near Lyon, in eastern France. The machine is to be installed & commissioned in August. Applitec SA was established in 1990 and commenced contract converting operations in 1995. The company has established an extensive clientele which includes customers throughout Europe, in South Africa, the USA and even in Japan for contract slitting & rewinding services. “When the time arrived to look for a new slitter rewinder, we naturally wanted to discuss the technology on offer from Atlas Converting Equipment Ltd.,“ explained Mr. Michel Junet, owner and founder of Applitec S.A. “We installed a Titan SR6 in 1996 which has been a true workhorse for our operations so we were very aware of the build quality, low cost of ownership and performance continuity that comes with a Titan slitter rewinder. We are a small company and operate with a lean structure which does not include dedicated engineers. So reliability and low maintenance are even more important for us,“ he confirmed. The design concept of the new generation Titan SR9 Series, which focuses on three key criteria of optimum efficiency, optimum rewind quality and modularity, was critical in the discussions at Applitec and resulted in Atlas Converting Equipment being chosen as the partner for their latest slitter rewinder project. With its modular design of unwind, slitter & rewind sections, the SR9-DS Duplex Shaft slitter can be upgraded to either a Single Turret or Dual Turret (ST or DT) format in the future to meet increased production requirements, by only having to change the rewind module of the slitter. “This is a very appealing design concept for our business. Our production volumes are constantly increasing and we have just completed two record months,“ he confirmed. We are confident that we will be able to meet future capacity whilst ensuring optimum efficiency, thanks to the range of upgrade configurations available on the Titan SR9-DS slitter,“ he concluded. 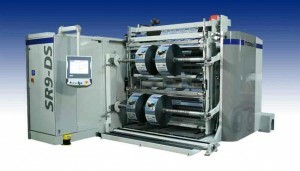 It was quickly understood that the ability to have the Titan SR9-DS slitter supplied in a width of 2250mm would provide Applitec with an advantage in their business as a contract converter.“The key to our success is the ability to offer our customers a wider choice of products and the fact that we can process wider reels contributes greatly towards this,“ Mr. Junet continued. “Our business also needs be able to convert as many materials as possible, including a wide range of papers, flexible materials and non-wovens. I am confident that the new Titan SR9 will ensure that we can meet the market demands of our business, “ he added. 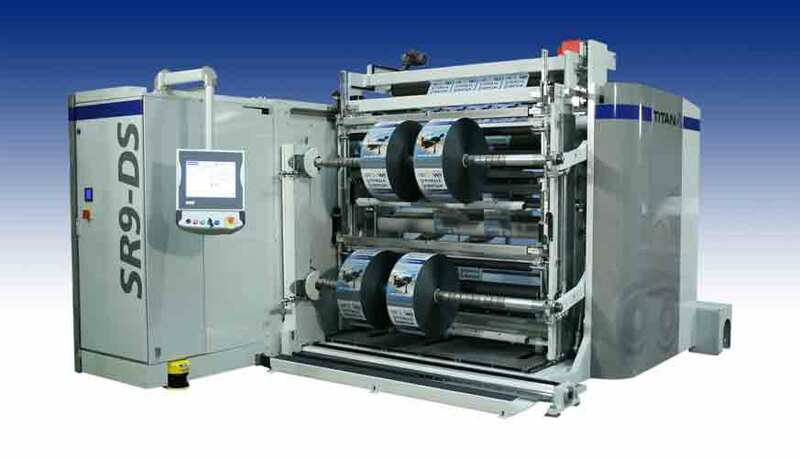 The Linear Tracking Slitter (LTS) section ensures the shortest and a constant web length between the knives and the rewind shafts for improved web control, giving the highest possible side wall quality of rewind reels and also reducing the possibility of waste material. Many other new features of the Titan SR9 Series provide exceptional performance and productivity at running speeds of up to 1,000m/min. The SR9 Series is available in two widths of 1650 and 2250mm and sets a new benchmark in productivity levels for a secondary slitter rewinder for flexible materials.